Sir Thomas Kirkpatrick, under date 4th March, 1756, writing to the Philosophical Society, which communication appears in the Society's Transactions, Vol. 49, Part II., of that year, and which is also included in Dr. Ramage's volume, describes a violent agitation that manifested itself in the waters of Closeburn Loch a short time prior to the date of his letter. In consequence of the burning down of the mansion-house— which untoward event occurred on 24th August, 1748, through the carelessness of some drunken servants— Sir Thomas was then living at the Castle, and had therefore ample opportunity of witnessing the commotion he describes. "About a quarter before nine on Sunday morning (21st February, 1756) we were alarmed with an unusual motion in the waters of Closeburn Loch. The first thing that appeared to me in this wonderful scene was a strong convulsion and agitation of the waters from the west side of the loch towards the middle, when they turned and wheeled about in a strange manner. From thence proceeded two large currents formed like a river, which ran with swiftness and rapidity beyond all description, quite contrary ways, one from the middle to the south-east and the other to the north-east points of the loch. There they were stopt short, as the banks are pretty high, and obliged to turn, which occasioned a prodigious tumbling and agitation at both ends of the water. There was likewise a current, which rose sometimes considerably above the surface near the west side, that I frequently observed running with great velocity an hundred yards to the southward and returning in a moment with as great velocity the other way. What I noticed, in the next place, was the tossing of the waters in the ponds, which were more or less moved as the agitations of the loch came nearer the side or kept a greater distance from it. But as it is beyond my capacity to give a particular description of all that happened upon this occasion, I shall conclude with telling you that the agitation and current above-mentioned continued with-out intermission for at least three and a half or four hours, when they began to abate a little in their violence, though they were not quite over at sunset. I had almost forgotten to tell you that this strange phenomenon was renewed on Monday morning a little before nine, and lasted for an hour and a half, but the motion of the waters was not near so violent as the day before. What is very remarkable, there was not the least breath or gale of wind on Sunday till one o'clock, a circumstance which baulked us not a little in our observations." This strange and violent disturbance was felt all over the South of Scotland. By some, it has been thought to have been co-temporary with the disastrous earthquake of Lisbon, but the dates do not agree,— that memorable convulsion occurring the previous year (1755). In the case of the Closeburn agitation, the people who were on the way to church were so terror-stricken that they declined to go inside the building, and the minister (the Rev. Mr. Lawson) conducted the services in the churchyard; such was the reluctance to enter a building of any size until the tremor of the earth subsided. Another singular phenomenon, though of a different nature, occurred in Nithsdale in July, 1783, when a vast water-spout, accompanied with tremendous thunder and lightning, emptied itself in the district, doing fearful damage to the country side, particularly in Scarr Water. Describing this remarkable occurrence, a writer of the period says,—"Herds of cattle and their keepers were surrounded suddenly; people at work were obliged to flee for shelter, and were in danger of being enclosed; hay and timber were carried off; one stone bridge, and a house, with the wool of 1200 sheep, were swept away; and dreadful gulfs of whole acres were made on the face of the hills." Thanks to Ranald McIntyre for sending in these maps. 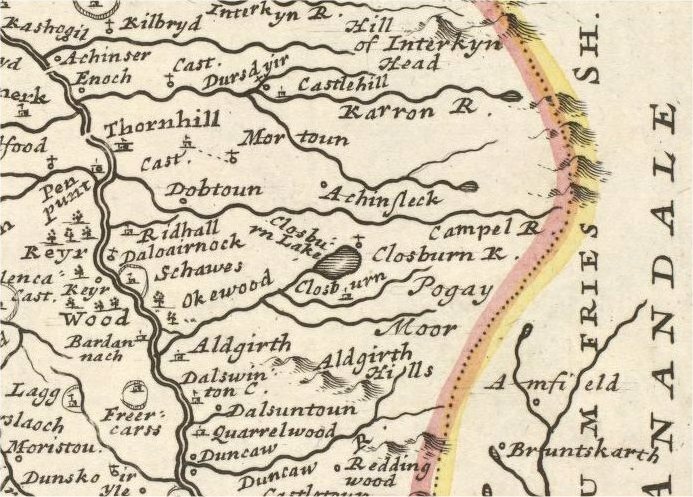 The first one shows the loch in this map of 1745 and the second one shows a current map with no loch. 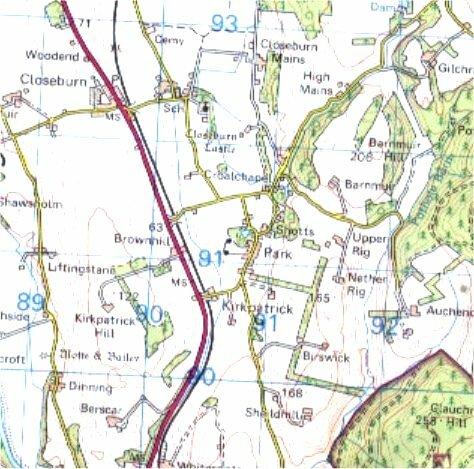 Looking at our Closeburn entry in our Scottish gazetteer it notes that the loch was filled in during 1853. Further earthquakes have hit this region and in quite recent times.